Happy Monday friends! Only four more days of hotel living! I’m anxious to get back into a normal eating routine of prepping and cooking my own meals. I’ve been “vacation eating” for the last ten days and I think my body hates me. Last week however, I made this super simple, superfood salad for lunch because I was just craving something green, something clean! After hitting the fast-food drive thru for my kids (yep, totally that mom this week) I ran and grabbed a few ingredients from the grocery store to make a light and refreshing salad. That just so happens to be packed with fiber, antioxidants, and vitamins K and C. And it’s so simple I threw it together in my itty bitty hotel kitchen with just a few ingredients! The greens: baby kale and finely chopped brussels sprouts. The goods: oranges, cranberries, and pecans. 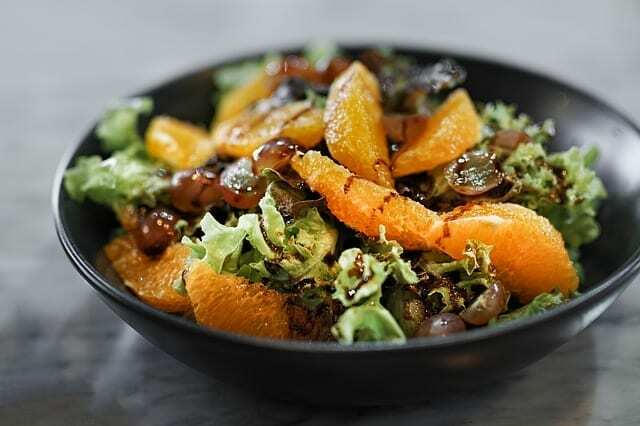 All tossed together in a super simple Orange-Honey Balsamic Vinaigrette. Gently toss baby kale, brussels sprouts, orange chunks, cranberries and pecans together. Whisk dressing ingredients together and drizzle desired amount over salad. Toss together and serve.